I was always fascinated by lightning. Long time ago, being a teenager I shoot lightning strikes many times with some degree of success. At that time I was using my dad’s old Zenit camera. While lightnings are always the same, equipment advances very rapidly. Today I will talk about spotting interesting frames from video and detecting exact moment of strike using Python. This is relatively simple task for a script – measure difference between two frames and if it exceeds predetermined value assume this is lightning. Key idea – lightning produces lots of light and alters many pixels. So, being Python and computer vision enthusiast, I wrote quick and dirty OpenCV script to find specific frames in long video to spot lightning strikes. It happened that script is pretty fast and processes 15minutes of raw 1080p@60 footage from GOPRO camera in 8 minutes on i7 CPU. Besides spotting interesting pictures it saves motion values to CSV file for further analysis using other tools. Here is how motion time-chart looks like. In general this is fast motion detection script without localization feature. Setup was out of the box – GOPRO 3 black action camera without any harness. It was just recording plain video. All processing was done on computer. GOPRO CMOS sensor has rolling shutter and has no manual exposure settings. That’s why many frames are split into dark and light areas. There a good thing to use ND filter to make exposure longer. 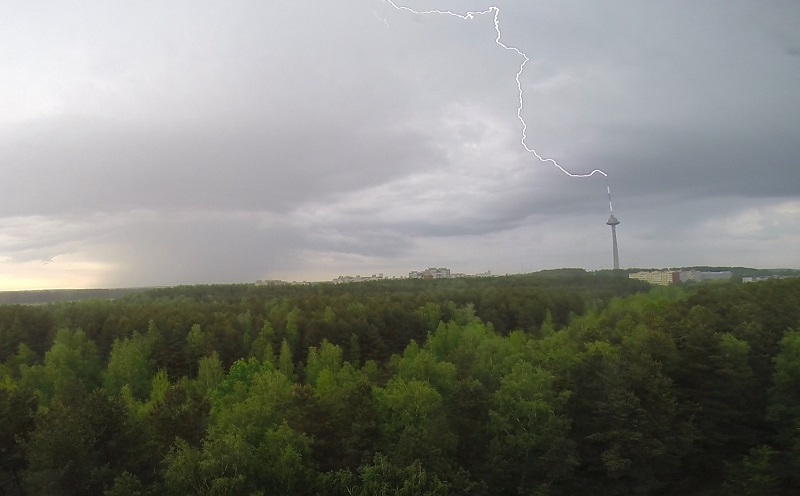 In this way whole lightning strike will fit into frame and picture will be higher quality. Of course best option is to use global shutter camera, but it is difficult to find this kind of camera. Are you thinking about keep publishing the shots here on your blog? I’m also fascinated by lightning, I can stay hours and hours looking at it. We have pretty nice ones here in Brazil. Hi Regiscruzbr, thank you for your support! Of course I will publish new shots on my blog. Waiting for new lightning storm. Feel free to share your pictures, Brazil is an amazing place and you should have impressive pictures too. Great! Here some suggestions: you can also try to capture only frames that are lighter then previous, also OpenCV stores pixels in BGR format (it affects how grayscale image gets computed), blurring images that needs to be compared can also reduce a lot of noise on your graphs. Hi Ivan, thank you for suggestion. Will try later today! Awesome project! I have a lot of various videos with lightning strikes from GoPro and other cameras that I would love to use your script on. I have been trying to get the script to run, I have added OpenCV,numphy and Pillow of the modules to Python 2.7 on Windows but I am missing the import progress module could you point me in the right direction where to find it? How do I import my video’s to the script. python script takes two arguments first is video file name, second is threshold. For example [main.py video.avi 10000] threshold has to be chosen by guess depending on results. Hi Daniel, I think you have not provided threshold value. Your command line should look like “Test.py Test.mp4 10000”. Okay, I got that to run, but it is not really processing the mp4 file. and the csv file it generated is blank. Should the video file be avi instead or should that even matter? Hi Daniel, yes I guess should be converted or search for instructions on Python forums how to make PIL read MP4 files. For someone new to python and trying to understand the script with no comments, how would I do that…raw read from the h.264 file would be great to have. This would be awesome if you actually provided some instructions. I am a photographer, not a programmer and I have no bloody clue what to make of this script. I guess I should prepare standalone scripts for easier use. What OS do you use? Hmmm... please contact me another way.